First Nations’ reserves in Canada have been struggling with the issue of feral or semi-feral dogs, according to an article in the National Post in Canada. Some of these dogs are “unwanted pets dropped off by residents of nearby cities, but often wholly feral offspring of wholly feral animals, themselves still puppies… ” the article says. Kato, formerly called Richard, was one of those pups. He was rescued by New Hope Rescue in Saskatoon, SK, and he and others picked up on the same rescue mission were posted for adoption on Petfinder. Kato snuggles in for a nap. Kelsey Huber wanted to adopt a puppy and saw Kato’s listing. “We initially picked him out,” she says, “because of how handsome he was. His markings are some I’ve never seen before — and his eyes are such a soft grayish brown.” The Hubers, who live in Martensville, SK, adopted him. He may have been born feral, but loving care in a foster home had already had an effect. By the time Kelsey met him at about two months old, he was friendly and affectionate — and smart. He was quickly house trained and even lets his new family know when he needs to go out. 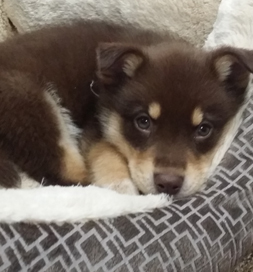 After an iffy start, the little fuzzy pup is now safe, warm and loved.